Those who know me also know how crazy I am when it comes to birthdays – be it someone else’s or my own. 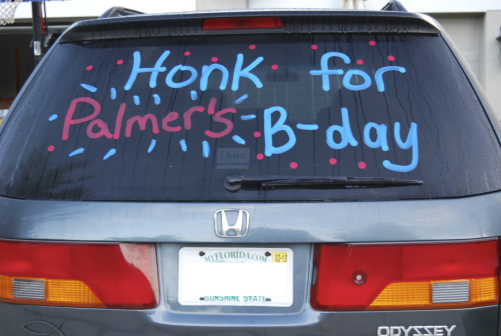 And when it comes to H’s birthday, I go all out. However, I don’t believe in hiring a professional party organiser. I prefer to take the DIY route instead and do thinks in my own special way. 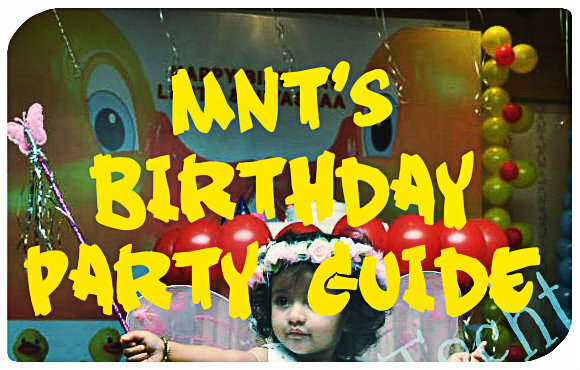 Care to check out what all we did on my kiddo’s First Tooth bash and first and second birthdays. I love the concept of keeping a wishing tree, to collect guests’s wishes. But keeping them intact over the years can be a tedious job. 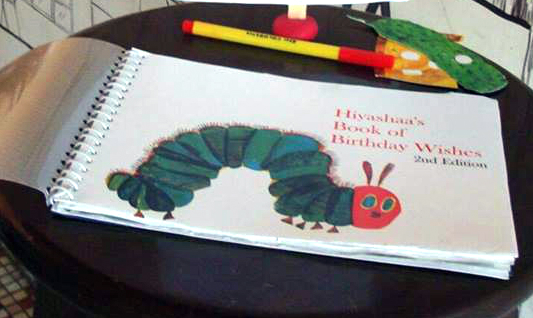 So, to make it easy, I made a keepsake Very Hungry Caterpillar Wish Book on H’s second birthday. You can do this every year. Imagine how fun it will be to go back and read the wishes when your kid grows up! I’m sure many of you must be already doing this. And those who are not, do give it a try. Gift all those letters to your kid when he/ she is grown up enough to understand. Don’r sweat about your writing skills, kids don’t worry about your writing skills. Tell me a kid who doesn’t love balloons. 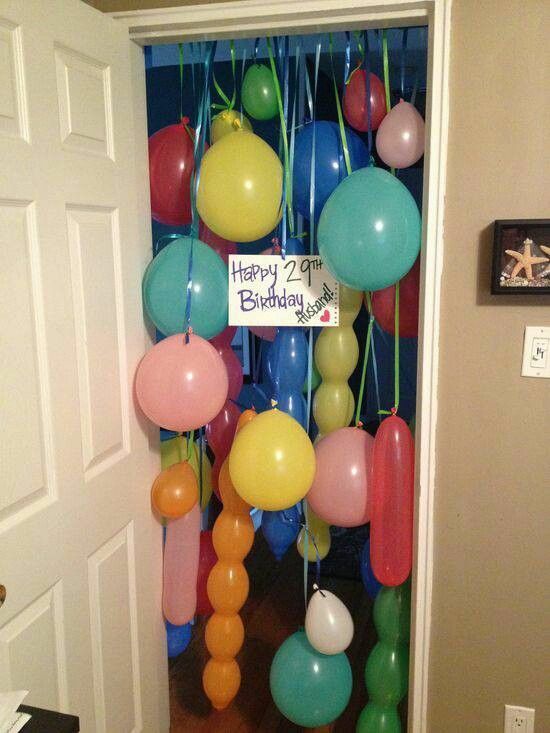 On the birthday eve, sneak into your child’s room when he/she is asleep and fill the entire room with loads of balloons and streamers. They would love to wake up to the fairyland kinda set up. Add more drama by sprinkling a confetti trail on the way from his room to living room. I’m going to do this one! How about organising an annual photoshoot with the birthday boy/girl and his favourite people and things? 6. It’s time to do! “Mumma, when Hiya becomes big, she can put (wear) lipstick,” that’s how I have been stopping my 2.5 years old from applying lip colour. I’m sure even you must have set certain time limits for your kid. So, have a plan for every year. For instance, Hiya can put lipstick when she is 8. Or she can learn photography when she is 10. Make a promise and live that on the pre-decided birthday. 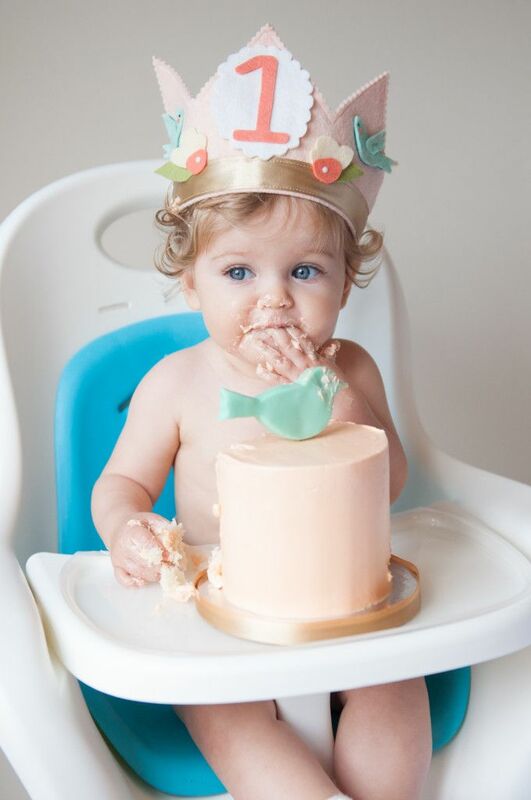 After all, birthdays are all about growing up! Let the birthday kid rule the meal plans for the day. 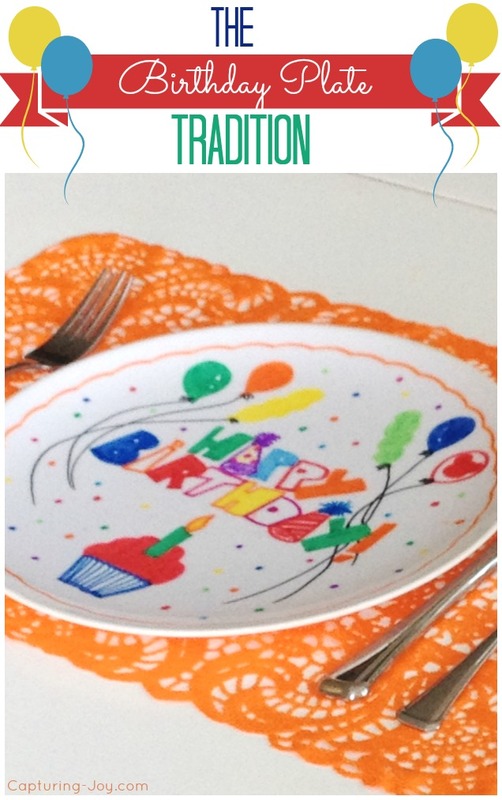 How about having a special plate for the special one for the day? 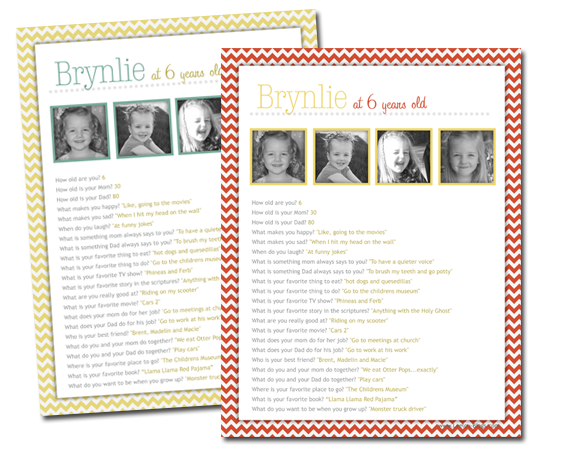 Even though they stay with you ask the grandparents and cousins of your child to send birthday cards. Kids love to read their names and address on posts. Continue this tradition even when they are adults. I became an instant fan when a friend did this on her son’s birthday. In the invite, they mentioned, “Please don’t bring gifts but bring your pre-cared toys.” The entire collection was donated at an orphanage. Buy a book on every birthday. 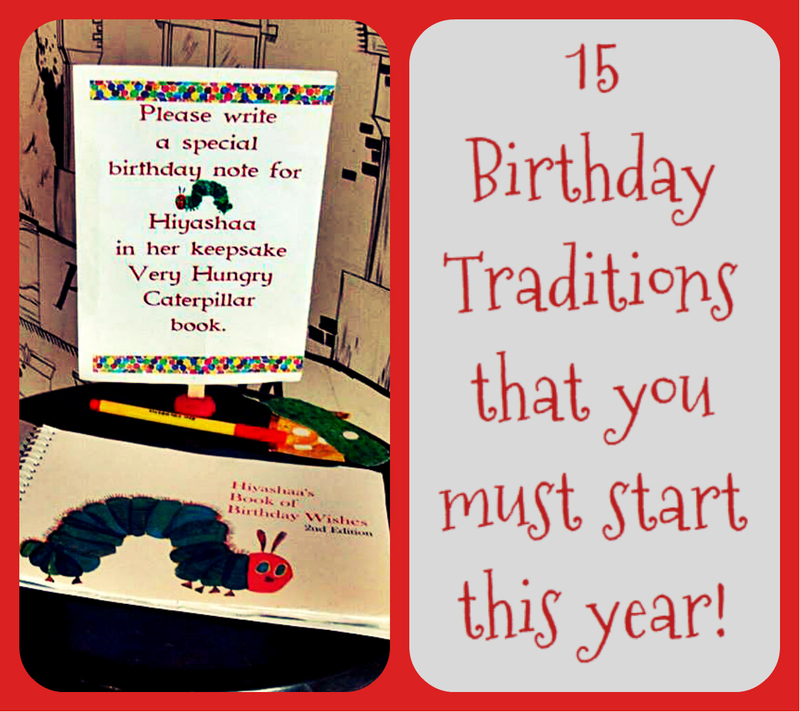 From a book on the theme of the birthday to an interest or hobby your kids are pursuing. I would love to continue with this tradition even when I am 60 and beyond! Another interesting idea to to be made into a tradition is reliving the memories. 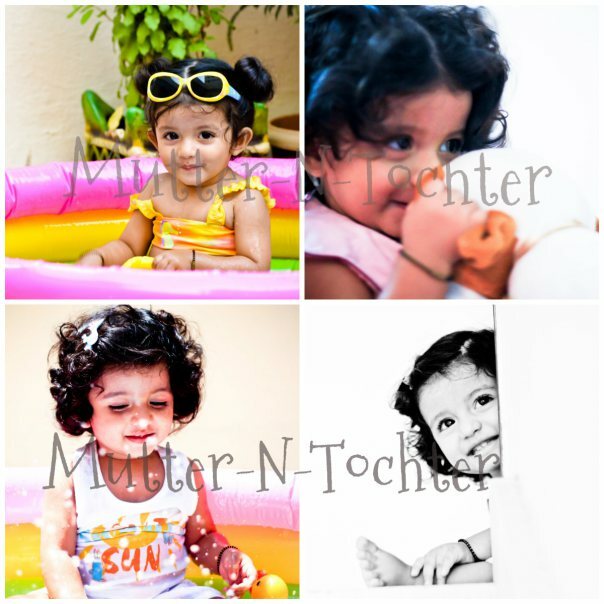 Make a photo slideshow of images of your child from birth till the current year. Make your child feel special all through the day by giving him gifts every hour. Nothing big but small things that can bring smile on his face. From sneaking them into the tiffin box to stuffing their pockets, let your imagination get wings. Let them take all the decisions on the special day – from planning the party and cake to breakfast, lunch and dinner. Weird reasons why kids cry!